This webinar series will allow attendees the opportunity to ask questions about participating in Arizona Gives Day at the end of each session. This is your chance to get your burning questions answered! What is Arizona Gives Day? Arizona Gives Day is a powerful 24 hour online giving movement that unites Arizonans around causes they believe in. Hosted by the Alliance of Arizona Nonprofits and the Arizona Grantmakers Forum, Arizona Gives Day is a great way for nonprofits, large and small, new and established, to generate excitement and resources for their mission, learn how to use new digital tools and fundraising strategies, and connect to the community and donors. This single statewide day of online giving has raised $13.4 million for Arizona nonprofits since 2013. Participating nonprofits also receive training, marketing support and a chance to win bonus prize money. 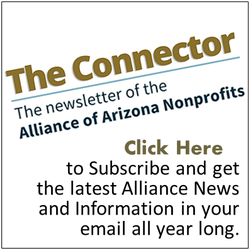 The Arizona Gives website is a secure and trusted place to make donations throughout the year as all nonprofits have been vetted to ensure they are a valid 501c3 organization. Donations received are distributed to nonprofits on a monthly basis. The Alliance of Arizona Nonprofits will offer a series of FREE webinars available to assist participating nonprofits with running successful Arizona Gives Day campaigns. Arizona Gives continues to seek opportunities for participating nonprofits to take advantage of webinars focused on all aspects of fundraising and donor cultivation throughout the year. You may also be interested in learning more about our FREE Nonprofit Toolkit.